What is a key signature – and how do I tell what key signature a piece of music is in? And do I even need to know this for guitar? The answers to these questions (and hopefully other questions about key signatures) will be covered below. This is a discussion of the basics of key signatures. There are more complex things surrounding key signatures but they won’t be discussed here. What is a Key Signature? A key signature, in essence, is a way of labelling a certain scale in music. For example, typically speaking, if a piece of music uses the notes of a C major scale it would be said to be in the Key of C. If the piece of music used the notes from the B minor scale it would be said to be in the key of B minor. Key signatures are a way of writing these keys on a piece of music to indicate what key the music is to be played in. For written music using key signatures is very useful. 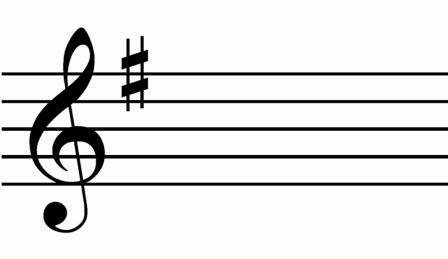 Rather than notating a sharp (#) or a flat (♭) symbol next to every note, a key signature is notated at the start of the piece of music and any notes that are indicated to be sharp or flat at the start are played that way – without having to notate sharps and flats throughout the entire piece, which would get very messy, not to mention being very time consuming. 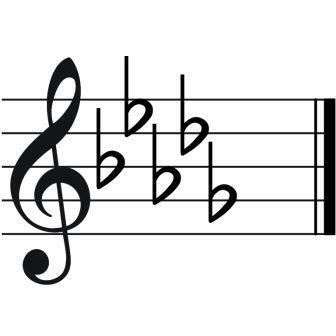 This indicates that every F note in that piece of music is to be played F sharp (F#). What are the Different Key Signatures? The following are the different key signatures and the sharps and flats that they have. Some keys are written with flats and others are written with sharps. This table shows the major keys and also shows the relative minors. Relative minors are minor keys that use the same notes as one of the major keys. You may have also been confused by the likes of C♭ Major – given that there is no C♭/B# note technically. C♭ is another way of saying B – so it makes sense that using B is the easier route to take. Do You Need to Know this for Guitar? Short answer – not at all! It’s not a need for guitar if you are playing certain music – rock, pop, country, blues, etc etc. But in some cases it can be useful. It might be more of a need if you are playing more classical music – or if you are composing more classical music. But it can still come in handy for both playing and writing if you understand this stuff. And the same goes for most musical theory – you don’t need it to play guitar – there is guitar tab after all, but a lot of it can certainly come in handy. There are some of the basics of key signatures. This is by no means a complete discussion on this topic – but hopefully it has given you some basics to introduce the topic.